The much-awaited Test series between Australia and India finally kicked-off on Tuesday in Adelaide on an poignant note in the memory of the late Phil Hughes. The players looked emotional as they committed to memory of Hughes, before readying themselves for the first encounter of the 4-match Test series. Australia captain, Michael Clarke, won the toss and decided to bat first, which eventually proved to be a decent choice, with the hosts piling up 354-6 on Day 1. The Australians got off to a blistering start with David Warner schooling a relatively inexperienced Indian bowling unit, before Ishant Sharma got a sigh of relief in the visitors’ camp by dismissing opener Chris Rogers (9). Even Shane Watson (14) couldn’t survive longer, edging a delivery from fast-bowler Varun Aaron into the hands of Shikhar Dhawan at slip. 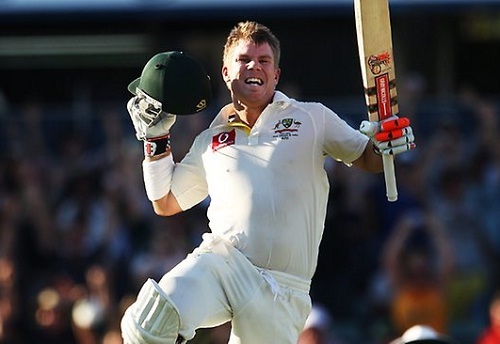 Warner, then, rode on his sublime touch to partner skipper Clarke for a magnificent 170-run stand. Despite a back injury, Clarke amassed 60 runs, before aggravating the pain and was eventually compelled to retire. Up next, Steve Smith joined Warner into the middle as the duo looked spectacular together. The latter accelerated his innings to bring up a quick fire ton. Their fluent 88-run stand came to an end when Warner (145) gave away his wicket to debutant Karn Sharma. The Indian bowlers struck made a lethal comeback into the match by bagging 3 wickets for just 10 runs in the final session of the day. Besides Mitchell Marsh (41), night watchman Nathan Lyon (3) and Brad Haddin (0) fell cheaply. For the tourists, Mohammed Shami and Varun Aaron struck twice, while Ishant Sharma and Karn Sharma picked up a wicket apiece.